Looking for a pretty and tasty dessert recipe? Look no further! 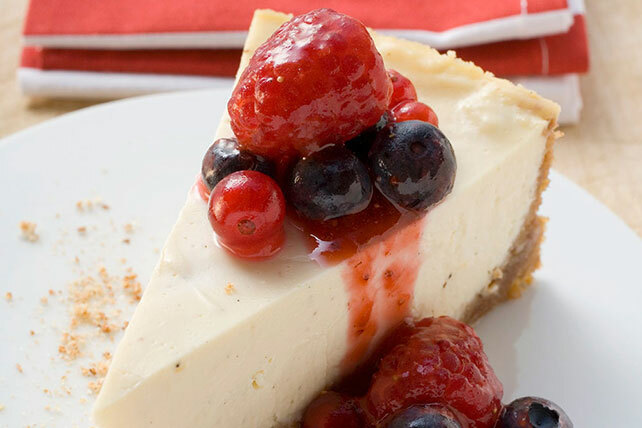 This berry cheesecake recipe is sure to impress. With velvety cream cheese, fresh berries and a classic graham crumb crust, this is a winning cheesecake recipe! Mix graham crumbs and butter; press onto bottom and 1-inch up sides of 9-inch springform pan. Beat cream cheese, 3/4 cup sugar and vanilla in large bowl with mixer until blended. Add eggs, 1 at a time, mixing on low speed after each just until blended. Bake 35 to 40 min. or until centre is almost set. Run knife around rim of pan to loosen cake; cool before removing rim. Refrigerate 4 hours. Meanwhile, mash half the raspberries with a fork in medium bowl. Add remaining raspberries, blueberries and remaining sugar; toss to combine. Serve over cheesecake. Try the fruit topping with strawberries and peaches for a colourful twist!